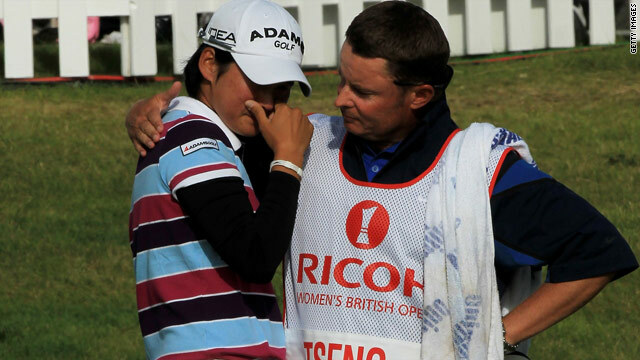 A tearful Yani Tseng was congratulated by her caddie after making history at Royal Birkdale on Sunday. (CNN) -- Taiwanese golfer Yani Tseng became the youngest woman to win three major trophies after claiming a tense one-shot victory at the British Open in England on Sunday. The 21-year-old broke down in tears as she overcame a jittery approach to the final green at Royal Birkdale to make history as the first player from her island to win the event. Her ambitious long drive into the first fairway bunker at the par-five 18th gave Katherine Hull -- Tseng's fellow first-round leader -- the chance to take the tournament to a playoff. But the Australian -- who matched Tseng with an eagle at 18 on Thursday -- was well short of the pin with her chip from off the back of the green, and then her birdie putt slid just past the hole. Tseng clinched her second major title this season with a solid six-foot putt for par, which Hull could only match, for a winning total of 11-under-par of 277. "I was so tired, there was so much pressure out there and it's been an unbelievable day. Even when I holed the putt at the last I had to ask my caddie 'Did I win?," a relieved Tseng told reporters. "The last four holes were very hard and Katherine pushed me all the way. She's an awesome player." The 2010 Kraft Nabisco championship winner closed with a one-over 73 after faltering with three bogeys and two birdies, while Hull cut her four-shot overnight lead with a four-birdie 70. Neither player could beat par in the last five holes, with Tseng's last birdie of the day coming on the par-five sixth. "I'm disappointed but there are also a lot of positives to take from this week," the 28-year-old Hull said after only her second top-10 finish in 24 majors. "I never gave up but it's just a pity I couldn't make a birdie at one of the three long holes at the end." Na Yeon Choi eagled 18 to finish in a tie for third with In-Kyung Kim on 281, carding 68 to her fellow South Korean's 71 -- which ended with a birdie. American veteran Cristie Kerr finished equal fifth after South Korean duo Amy Yang and Hee-Kyung Seo closed with birdies to join her on 282.